I’ve always been curious about the popularity of the bashos across days. Do they start with a wide viewership and then fade across the days? Or do they start with a small viewership that builds up to the very end? 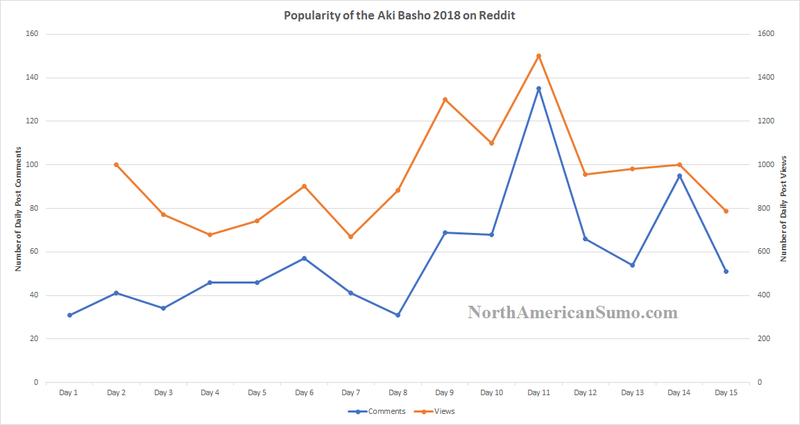 I decided to (somewhat) answer this question by looking at the Aki Basho 2018 posts on Reddit.com/r/sumo. Because I made the posts for Day 2 through 15, I could see the number of views for each daily post except for Day 1, and I could get the number of comments on each post for each day. So, I decided to chart the findings. Click here to get a full-size image of the chart. As you can see, the number of comments started pretty low and increased very slightly until Day 10. On the other hand, the number of views started pretty high, dropped back down, then accelerated on Days 8, 9, and 10. The number of comments and views peaked on Day 11, where both returned to a moderate level to finish out the basho. It seems that the beginning of the basho draws attention, but there isn’t too much to talk about at that point. Then, the viewers come back and begin to discuss more slightly after the midpoint. This is probably because the main storylines are shaking out, and the clear competitors for the yusho are being identified. The climax of the Aki Basho 2018 was certainly Day 11. On this day, Hakuho defeated Takayasu in a controversial match, and both rikishi were in the running for the yusho. Tochinoshin also defeated Kakuryu in a spectacular show of strength, which almost entirely settled any chance of the former receiving a make-koshi and the latter getting the yusho. After Day 11, it was clear that Hakuho was going to run away with the basho, which we see in the drop in viewership and comments in the following days. On Day 14 we see another spike in comments, in which Hakuho officially won. So there you have it. It seems that there is a U-shape in basho interest from the beginning to the climax, which returns to a moderate level to the end. If you have any comments or questions about this post, feel free to email me at NorthAmericanSumo@Gmail.com. Thanks for reading!